There’s little difference between Frederick Walrath and Frans WIldenhain. I exaggerate, of course. Still, you’ll note their initials are identical. Especially when you conveniently skip their middle names, as I have. And both were and continue to be known as studio potters. Each was a teacher. The former taught and threw pots at the Mechanics Institute from 1908 to 1918. The latter sculpted clay and taught at the Rochester Institute of Technology (RIT, and what the Mechanics Institute evolved to) from 1950 to 1970. Fred joined a relatively new department of Fine Arts that had been founded in 1902 by Theodore Hanford Pond. Frans was among the freshman class of faculty for the brand-spanking-new School for American Craftsmen (SAC) when it moved to RIT from Alfred in 1950. Charles Fergus Binns, “the father of American studio ceramics” who was an Englishman, was Walrath’s (among numerous others’) mentor at Alfred. 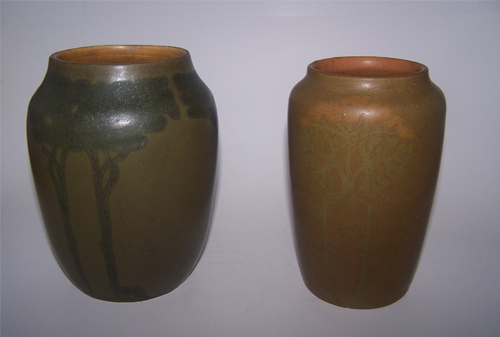 Also among Binns’ students were Arthur Baggs (Marblehead Pottery) and Charles Harder; the latter later studied at the New Bauhaus (which was later known as the Illinois Institute of Design). Frans Wildenhain studied at the Bauhaus. In Germany. He studied under Gerhard Marcks and Max Krehan. Among Marcks and Krehan’s students was one of the very first Bauhaus students, Marguerite Friedlaender (later, Wildenhain). This isn’t six degree of Kevin Bacon, is it? Dane Gordon’s 1982 history of RIT notes Wildenhain’s role in Shop One, but not his role at SAC. Referring to the book’s index, Gordon mentions not at all Walrath. Or, for that matter, Pond. Twenty years ago, I put together an exhibition on the Arts & Crafts Movement in Western New York. Offered at the Bevier Gallery, the exhibit featured approximately 40 pieces of Walrath’s work – at the time (and maybe still), the largest assembly of his work in one place. Beginning 20 August 2012, two RIT galleries – the Dyer Art Center and, again, Bevier – will feature nearly 150 examples of Frans Wildenhain’s work. There’s something going on here. Next time: enough with the men, here are two enormously influential women.